This is a scalable context timeline. It contains events related to the event December 29, 2002: US Military Denies Abusing Prisoners in Afghanistan, Says Treatment Better than before Capture. You can narrow or broaden the context of this timeline by adjusting the zoom level. The lower the scale, the more relevant the items on average will be, while the higher the scale, the less relevant the items, on average, will be. 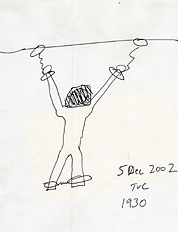 A sketch by MP Sergeant Thomas Curtis showing how Dilawar was chained to the ceiling of his cell. [Source: New York Times]Dilawar, a 22-year-old Afghan farmer and part-time taxi driver from the small village of Yakubi in eastern Afghanistan, is picked up by local authorities and turned over to US soldiers. Dilawar is described as a shy, uneducated man with a slight frame, rarely leaving the stone farmhouse he shares with his wife and family. He is captured while driving a used Toyota sedan that his family bought him to use as a taxi. He has three fares, men headed back towards his village, and is stopped by Afghan militiamen loyal to the guerrilla commander Jan Baz Khan. (Khan will later be taken into custody himself for allegedly attacking US targets and then turning over innocent villagers to US forces, accusing them of carrying out the attacks.) The militia confiscates a broken walkie-talkie from one of the passengers, and an electric stabilizer used to regulate current from a generator in the trunk of the Toyota (Dilawar’s family later says the stabilizer is not theirs; they have no electricity). All four men are turned over to American soldiers at Bagram Air Force Base as suspects in a recent rocket attack on the US base at Khost. They spend the first night handcuffed to the fence to deprive them of sleep. Dilawar is then examined by the base doctor, who pronounces him healthy. Passengers Shipped to Guantanamo, Say Bagram Treatment Far Worse - Dilawar’s three passengers are eventually shipped to Guantanamo for a year, before being released without charge. The three will describe their ordeal at Bagram as far worse than their treatment at Guantanamo. All will claim to have been beaten, stripped in front of female guards, and subjected to repeated and harsh rectal exams. Abdul Rahim, a baker from Khost, will recall: “They did lots and lots of bad things to me [at Bagram]. I was shouting and crying, and no one was listening. When I was shouting, the soldiers were slamming my head against the desk.” Another of Dilawar’s passengers, Parkhudin, later recalls that Dilawar “could not breathe” in the black cloth hood pulled over his head. Running Joke - Though Dilawar is shy and frail, he is quickly labeled “noncompliant.” One US military policeman, Specialist Corey Jones, reports that Dilawar spat on him and tried to kick him. Jones retaliated by giving him a number of “peroneal knee strikes” (see May 20, 2005). As Jones will later recall: “He screamed out, ‘Allah! Allah! Allah!’ and my first reaction was that he was crying out to his god. Everybody heard him cry out and thought it was funny. It became a kind of running joke, and people kept showing up to give this detainee a common peroneal strike just to hear him scream out ‘Allah.’ It went on over a 24-hour period, and I would think that it was over 100 strikes.” Several other guards will later admit to striking Dilawar. While most MPs deny any knowledge of Dilawar being injured by the physical assaults, Jones will remember seeing Dilawar’s legs when his orange drawstring pants fell off of him while he was shackled. “I saw the bruise because his pants kept falling down while he was in standing restraints,” Jones will later recall. “Over a certain time period, I noticed it was the size of a fist.” Dilawar’s repeated cries and pleas for his release do little besides annoy his captors. 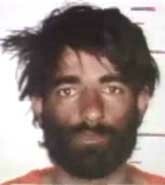 Dead Days Later - Dilawar will be found dead in his cell days later (see December 10, 2002). Dies While Chained to the Ceiling - An interrogator, presumably Yonushonis, promises Dilawar that he can see a doctor after the interrogation session concludes, but Claus tells the guards not to take him to a doctor. Instead, Claus tell the guards to chain him to the ceiling again. “Leave him up,” one of the guards will later quote Claus as saying. Dilawar dies while chained up; hours later, an emergency room doctor sees Dilawar’s body already dead and stiffening. Yonushonis reports the abusive interrogation to his superior officer, Staff Sergeant Steven Loring, but Dilawar is already dead.